The first four Ransom shots were quite impressive. Then the 5th ruined the group into something still respectable. 1. Was it the ammo going astray? 2. Was it the gun throwing the shot? 3. Was it a glitch in the Ransom or the operator? The gun by the way is an Oregon Precision Arms with CCI SV paper. My WAG is lead build up because of cold temperatures. Hi Jack. I seem to have trouble with all of my mouse guns when it gets cold out. I have never seen any test results to support my theory but I know I shoot better groups with faster 22 ammo when it gets cold. That's my W.A.G. and with another 1.50 you can buy a cheap cup of coffee in Eugene. This was actually months ago before it got cold. Len, if we don't run into each other before we do league, PRP Sectional or something, I will carry along the HS106 box for you to one of those. Try some Eley Red Box. I did do Eley Yellow. It was a little better than the CCI 5, but not as good as the CCI 4. Ammunition can vary, even with the same lot. ONE group, only 5 shots to evaluate? Way, way too much room for Mr. Random to totally screw up the results, both on the side of tighter than the ammo/gun really shoots, AND on the side of being the one worst possible group of 5 the combo is capable of doing repeatedly. Heck, those 5 all together might be the outlier which falsely points to the gun/ammo being that accurate. 4-inch at 50 yd gun/ammo combinations shoot the occasional 1.25-inch group often enough to make many of our fellow shooters believe their guns (and/or their own skillz) are much better than they really are. In other words, there is an equal chance (in my rudimentary math/statistics educated opinion) that the four in the bughole group are the fluke, as there is that the single one out of that bughole is the aberration. That's why the NRA for decades has relied on the average of five, 5-round groups for gun and ammo evaluations. Looks like X-ring for all 5 together. Without more, it would be distressing to try to choose exactly where to zero it...weighted midpoint of the group or disregard the flyer. It being the last shot does carry some suspicion of any of your three suggested errors, plus the fouling possibility mentioned above. IF you had weighed all the rounds (and they were in a narrow range) and sorted for rim thickness (same thing, all nearly identical) first, then I would look more towards the gun or the rest or the operator. That, plus a tight patch down the bore looking for lead flakes, is what it would take for me to eliminate the ammo as a possible culprit. It's so easy to screw up the ransom. That group still looks pretty small. More shots needed. According to the AMU armorers I talked to at Perry 2 years ago, they do 30 shots per group when evaluating their hardball guns. 5 shots on one target isn't enough. In short, my ransom set up was not a solid as I thought.. One more yard of concrete, 1000lbs of welded in I beam, and a complete rebuild of the ransom base and the system which secured it, cured the problems..
Can you post a photo Jerry? Of course it takes more shots to be statistically valid. I have said here many times that all the 5 and 10 shot groups I ever Ransomed grew by 1.5 times or 2 times when 20 or 30 shots were fired. My questions point was about when you have a very tight knot of test shots, is that what the gun can do if given totally consistent ammo and Ransom operation. And you would write off the flyers as ammo caused. Anyway the followup question then is why do we put so much faith in the 5 shot tests Marvel and others produce? I have never been able to duplicate them even with the same ammo and my best technique. BTW Our Ransom base is very solid steel and cement. Roddy uses it to shoot 1" Nosler 10 shot groups. Jack H wrote: 5 shot tests Marvel produce? I have never been able to duplicate them even with the same ammo and my best technique. BTW Our Ransom base is very solid steel and cement. Strictly hearsay now.... But I have also questioned those groups.. I have been told, by someone who has supposedly seen it, that the test fixture used, is massive, and very robust. I have tested a lot of .22s but the best I have gotten is 1/2 to 5/8 inch area. I'd say that it is the ammo. 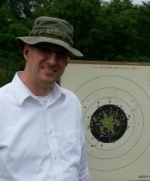 Of the CCI ammo I've tested, CCI Pistol Match was the best and most consistent. That was out of a Hammerli 208s. I tested Standard Velocity paper box, plastic box, Green Tag and PM. I'm anxious to see how that 52 will shoot once that new barrel is fit...-------ME Too..!!! 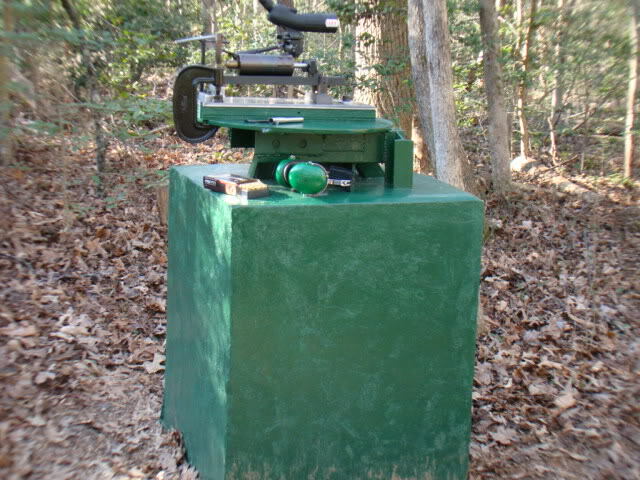 Here's one with the barrel tester. Imagine a huge amount of concrete under ground supporting a 12 inch I beam post with a plate on the top... I welded a huge amount of I beam sections to the existing frame work.. Formed it all in and poured another yard above ground. Welded the 1/2 thick circular plate to the I beam frame work, and use a 3/4 in Allen bolt as a pivot for alignment, and large c clamps to anchor the rear.. Groups improved instantly..I'll have to make a new pic of the RR mechanism.. Photo bucket makes me delete as I add to prevent a fee, so many pics are lost over time..This is located about 50 feet to the rear of my shop.. Please don't take offense, but you might be exhibiting "investigator bias" if you think the gun shoots 0.3" groups (no scale shown). As you note, the 5-shot group is "still respectable". Perhaps the "outlier" would still be in a group of 20 (or perhaps 40 or 50) and can't simply be ignored just yet. Now, if you have good data for the group sizes this gun is capable of, and that shot is 3 sigma out, then one might try to explain it. Now, regarding buying a gun sold by some purely hypothetical dealer, who shows several pistols laid out, each with a tiny 5-shot group but a different ammo type listed for each pistol, my first question would be "how did you test these pistols"?. An aside: I built an AR15 with a chrome barrel from "Parts is Us". My first five shot group went into 0.230" at 200 yds. I should have sold it right then to the guy next to me who wanted it badly. I never shot a group like that again, although it was an honest 1 MOA rifle. ..This is located about 50 feet to the rear of my shop.. In which case I'd say you totally screwed it all up by NOT putting it on the back step of your shop, next to patio furniture, a built-in gas barbecue and outdoor fridgideezer, with shade and a hot tub nearby. You could always move the parking spots out of the line of fire if that's an issue, you know. He can't put it there. I figure that is where he has the 155 mounted for rodent control.